We couldn't resist keeping another buck out of Mandy. We love everything about her and we are excited about the crossing of Mandy and Cedrus. 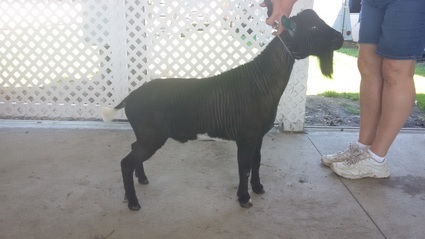 Desmond went to his first show and took first in his class 3 out of 4 rings. This picture does not do him justice. He is covered in wrinkles he is so dairy. We will try and get pictures that showcase them. UPDATE: He did it!! Desmond received both Grand Champion Senior Buck at the Mid-America Shootout Show 8/13/17 and if official he will be finished in all three registries. Our first homegrown animal to receive this.